In the next few months, Google will start to require Global Trade Item Numbers (GTINs) for any new, in-stock product that has a GTIN assigned by a manufacturer. In 2015, Google announced updates to the Shopping Products Feed Specification, which requires merchants to submit valid GTINs for all products falling under one of 50 designated brands. Google is now asking for more from more brands and products. "In 2015, we began requiring Global Trade Item Numbers (GTINs) for products from a list of 50 brands. Going forward into 2016, our requirements for GTINs will expand beyond those 50 brands to include all products with a GTIN assigned by the manufacturer." *Note: If you have existing products set up with either Google Merchant Center or Google Manufacturing Center and want to make sure they're updated with your official GTINs (and your latest content in general! ), Salsify can help you out. Additionally, Salsify's Readiness Report validates the check digit (i.e. the number used to check for input errors) which saves you tons of time and energy. Why is Google requiring GTINs? For your own good! GTINs are unique identifiers that allow Google and everyone else in the world to identify each specific product. That is, each type of GTIN identifies one product for all of the world. As ChannelAdvisor reported, "according to Google data, merchants that add accurate GTINs to their product data experience 40% more clicks, resulting in an impressive 20% increase in conversion rates." Are there different types of GTINs? • GTIN-12 (aka UPC-12): this is a 12-digit number mostly used in North America. • GTIn-13 (aka EAN/UCC-13): this is an 8-digit number used predomiantely outside of North America. • GTIN-8 (aka EAN/UCC-13): this is a 13-digita number used predominately outside of North America as well. • GTIN-14 (aka GS1-128 or ITF-14): this is a 14-digit number used to identify items at various packaging levels. 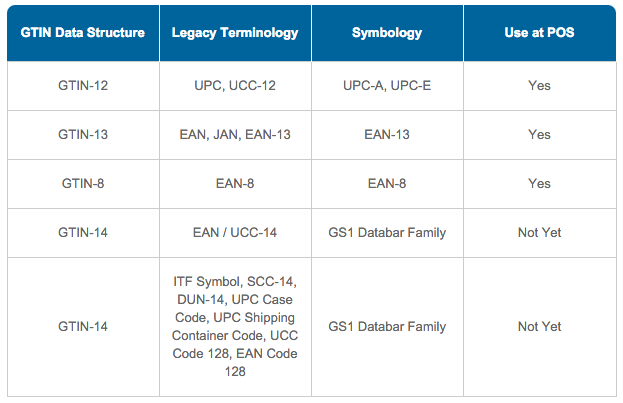 The table below helps you understand the relationship between GTIN, legacy terminology, symbologies, and use at point-of-sale. Ready to improve your presence on Google or have additional questions about the latest requirements? We have many customers who send product content directly to Google with Salsify.